Before Jim, Jobie, and I left Collierville two weeks ago, I asked members of several Facebook travel groups for suggestions of things to do and see in the Petoskey, MI area, and nearly everyone who responded recommended spending a day at Sleeping Bear Dunes National Lakeshore, which stretches 35 miles along Lake Michigan’s eastern shore. Last Tuesday morning, we left the bus in Petoskey at 7:15 AM and drove two hours south to the park, stopping at the welcome center in Empire for information and brochures. The guide marked on a map places where dogs aren’t allowed, including a few beaches where Piping Plovers are currently nesting. 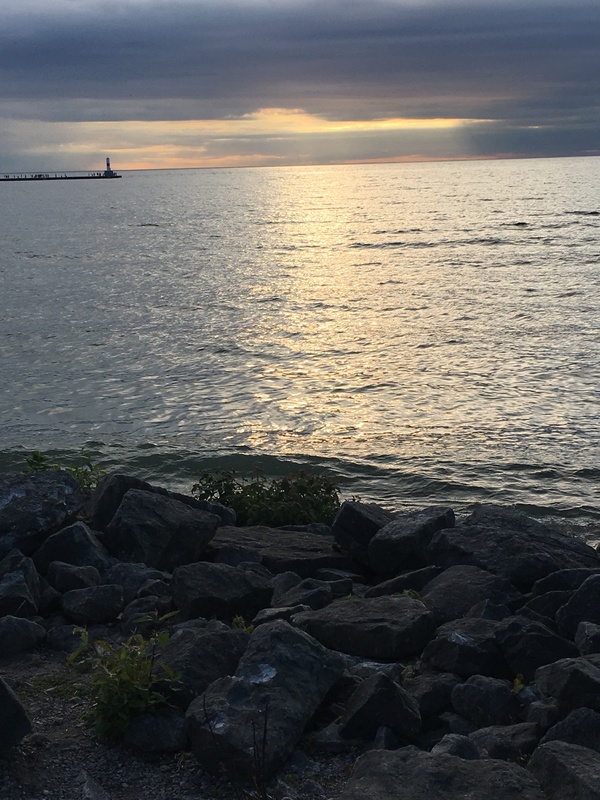 She highlighted the Lake Michigan Overlook, which she called the million-dollar view. We first hiked a forest trail up to Empire Bluff, a sandy area overlooking the lake. Sun glinted off the water’s glassy surface, and dunes rose up in the distance. After lunch at Joe’s Friendly Tavern in Empire, featuring Joe’s homemade root beer, we drove the Pierce Stocking Scenic Drive, stopping several times to take photographs and enjoy views of the woods, beaches, and lake. The three of us hiked to the Lake Michigan overlook, atop a dune 500 feet tall, the water below deepening from aqua to turquoise to deep jewel shades of green and blue. The beauty of this place defies its legend of a mother bear grieving her two dead cubs, as described below on the National Park Service website, though gazing toward Wisconsin across the vast lake, one can easily imagine the story’s origins. Past this overlook, we stopped to watch some people at the Dune Climb. Dogs aren’t allowed on the dunes in that area, and Jim and I debated whether to climb. Finally, he said, “Let’s go,” and I responded by untying my shoes and opening my car door. Jim followed suit, though he later said he’d meant, “Let’s go back to the bus.” We crossed the flat sand base and started climbing in bare feet. The temperature was about 70F, with a cool breeze off the water. The largest dune is nearly two hundred feet high, the incline steep, at times nearly vertical. Although I’ve been running regularly for about a year, up now to 3-4 miles at least four days a week, I was soon winded. With each step, I sank farther down into the deep, soft sand. Children ran up and down the dunes, making a game of tumbling to the bottom and climbing up again. Some adults struggled, stopping often to rest, and some gave up and turned around. On a distant dune, I saw hikers wearing backpacks inching toward the big lake along the 7 1/2-mile trail, deemed, because of the sand, the most difficult in the park. At the top of the first long climb, the sand leveled out for a few feet, and I was tired and ready to descend. But, the only view from there was of surrounding dunes, and I could see that a glimpse of Lake Michigan, from yet another perspective, would be the reward for climbing another fifty or hundred feet up another incline. And so, we climbed. I stumbled once, said I wasn’t going farther, but Jim took my hand to steady me, and we made it to the top. We saw more aspects of the glimmering lake, more dunes, other climbers. We snapped a selfie. The descent was relatively easy, and in the car, Jim and I marveled that we’d actually made the climb. We’d have previously most likely made excuses: we’d have to leave the Jeep running and leave Jobie behind, we were tired from the already long day, we hadn’t brought proper shoes, we had more important things to do, we’d get sand in our clothes, in the Jeep, in the bus. But, that day, we stopped and climbed, and we’ll always have the memory of those views, the fresh air, and the wind in our hair. I hope next time we have the chance, we’ll stop, climb, enjoy the scenery, and remember that this new life we’re embracing together is not about reaching a destination but about cherishing each step along the way. Jim, Jobie, and I arrived in Petoskey, MI Saturday afternoon. 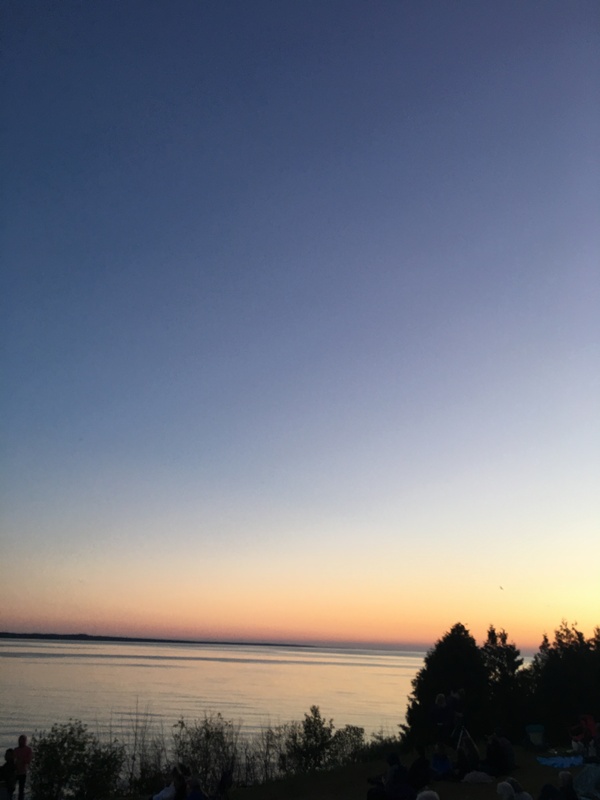 After spending a few hours hooking up and organizing the bus, we went into town and picked up a few things we’d forgotten to pack, had an early dinner at JR’s Hometown Grill and Pub, and drove to the shore to watch the sun set over Little Traverse Bay. National Oceanic and Atmospheric Agency (NOAA) predicted likely Aurora Borealis activity Sunday night into Monday morning as far south as Indiana. A Google search revealed the best place in this area for sky watching is the Headlands International Dark Sky Park, so we drove to the park and found the amphitheater, near the observatory, where we’d later gather with several hundred other people to wait for a glimpse of the lights. At 9:00 PM, we sat on the amphitheater’s stone seats, the setting sun glittering on Lake Michigan in the background. A park guide pointed out Jupiter and Saturn, pin lights to the naked eye, but powerful telescopes provided by Michigan State University revealed detailed portraits of Jupiter orbited by four moons and Saturn wrapped in rings. Once darkness fell, the guide announced that no cell phones or white lights would be permitted, encouraging us all to protect the darkness together. Savvy night watchers, which we decidedly are not, carried red lights in the form of flashlights, bracelets, or headbands. As darkness blanketed the park, hundreds of people, most wearing sweatshirts, jackets, blankets, flowed in, and we laughed that the thermostat inside our apartment is set lower than the outside temperature in the park. By midnight, when the wind whipped in off Lake Michigan, we were woefully unprepared in our shorts and tee-shirts; we zipped into sweatshirts, and I regretted not bringing a blanket. When the stone steps absorbed the cold, we took shelter against the observatory building. While we waited for a glimpse of celestial magic, the guide pointed out various stars and repeated the ancient stories passed along through mythology and Native American folk tales as well as traditional nursery rhymes. The crowd enthusiastically complied when she asked us to say in unison, “Hey diddle, diddle, the cat and the fiddle, the cow jumped over the moon,” as she identified the constellations and stars for which the rhyme was written. NOAA had initially projected Aurora would most likely appear between 11:00 PM and 2:00 AM EDST. At 1:30 AM, cold, hungry, sleepy, and with an hour’s drive ahead on curvy, poorly marked, unlit, rural roads, we reluctantly gave up our quest and drove back to the bus, watching northward all the way so we wouldn’t miss the lights should they materialize. I fell asleep regretting that we’d prematurely given up on what might have been a once-in-a-lifetime opportunity. Yesterday morning, I was relieved to read that Aurora Borealis’ only continental US appearance was in the skies of North Dakota about 4:00 AM. We’ll be here for five more weeks, thirty-five more chances to chase the elusive Northern Lights. Our home on wheels, and Jobie trying out the sofa.